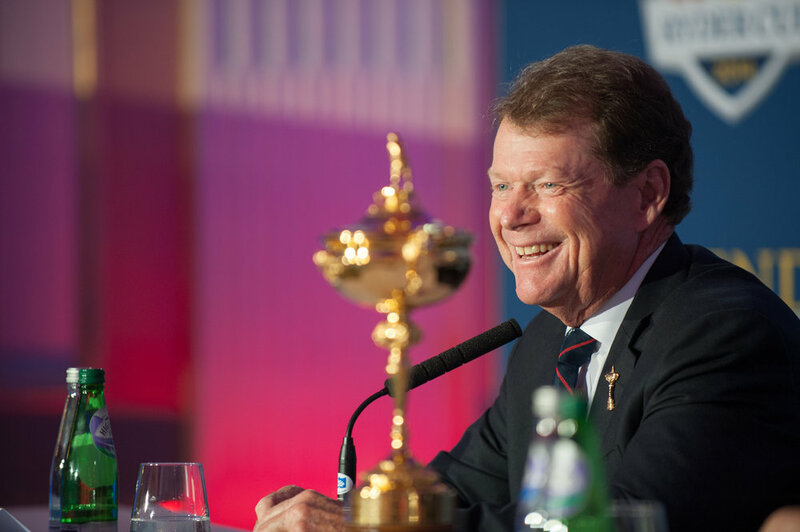 With five British Open Championship victories, Tom Watson knows a thing or two about winning overseas. Maybe that’s why the PGA of America selected him to be the 2014 Ryder Cup Captain for the American team set to play the European squad and reclaim the Cup at Gleneagles, Scotland, a country where Watson lifted the claret jug four times. At age 65, Watson will be the oldest Captain for either an American or European team, a small footnote compared to his near triumph at age 59 at the 2009 Open Championship where he lost in a playoff to Stewart Cink. Before that final round, his good friend, avid golfer and famed New York Times columnist Tom Friedman emailed him, “Even the Taliban are rooting for you!” A winning Captain of the 1993 Ryder Cup held at The Belfry in England, Watson competed as a player in four matches (1977, 1981, 1983 and 1989) and compiled a 10-4-1 record. He and Jack Nicklaus were undefeated (4-0) when paired together and remain one of the most successful duos in Ryder Cup history. Still a fierce competitor on the Champions Tour, Watson was interviewed in an exclusive session with The Grain’s Terry Moore. Talk about your first Ryder Cup match in 1977 at Royal Lytham and St. Annes and being paired with Jack Nicklaus. How nervous were you on the first tee? I was nervous but one of my saving graces was the idea I was playing with the best player in the world as my partner. So that relieved some of the jitters. One of the skills of the captain is knowing when and how to pair up a rookie with an experienced player. And our captain, Dow Finsterwald, really knew what he was doing. After you and Jack won the match 5 & 4, didn’t you all play in? Yes, we did which delighted the gallery but we really did it to see the golf course. In 1977, there were only three sessions overall—foursomes on Thursday, four-balls on Friday and singles on Saturday. (Note: In 1977, the Matches ended on Saturday) We played one match per day. In fact, I only played 158 shots total for the matches. It was an abbreviated schedule by design because Great Britain & Ireland thought they might be able to squeeze out a victory but reducing the number of matches to get an edge. But it didn’t work. Any other special memories from 1977? My most poignant memory of that Ryder Cup was the flag raising ceremony. Having never competed in the Walker Cup, when I saw that American flag go up it was very special. It was the defining moment in my career up to that point. I was able to say to myself, “I’m playing for my country” and it was a wonderful feeling. Dow Finsterwald (Captain) made an absolutely marvelous speech and it sent shivers up my spine. His speech had such an impact it inspired me to be Captain someday. And in terms of playing experiences? Along with playing with Jack on day one in 1977, I also fondly remember being paired with Hubert Green in a four-balls match against Brian Barnes and Tommy Horton. The first hole at Royal Lytham is a par-3 and it’s a hard green to hit. I hit a good shot onto the green while Hubert missed it to the left in the bunker. He made a pretty good bunker shot but still had a long putt for par. Our opponents were both just over the green but they putted up for a certain par. But then I holed my 40-foot putt for birdie two and we were off to the races. We were 6-up after nine holes and we were out in 29. We won 5 & 4 and it was a thrill. Talk about playing against Seve Ballesteros and Jose-Maria Olazabal. They were a great team. Seve came on the scene in the ’79 matches and he was only 1-4. But after that Ryder Cup he was superb. Seve and Oly had a certain aura about them that said, “We’re not going to lose.” And that’s the same type of aura I want on our team. I want to create that same sort of camaraderie and partnership feeling. Did you ever encounter any gamesmanship in the Ryder Cup by Seve or anyone else? No gamesmanship. The only time I was taken aback was during that match in 1977 when paired with Hubert. Six up at the time, I was on the green in two at the par-5 11th hole. The other team was off the green in two and then chipped up to within 12 feet for birdie. After I rolled up my eagle putt short of the hole to 4 feet, they made their birdie putt. When I missed the short putt to lose the hole, a loud cheer went up in the gallery. That cheer didn’t sit well with me. But once I thought about it, it made sense. Their gallery was pulling for their team to win. That’s when I understood what the Ryder Cup really meant. It’s a partisan event. You were paired with a lot of great players, including Jack Nicklaus. Are there any players in golf history you would’ve liked to be paired with? Byron Nelson, certainly one of the game’s greatest players. He often talked to me about his Ryder Cup experiences. Once he told me when he was captain (1965 at Royal Birkdale) Ken Venturi was playing on his team. In one of his matches, Ken hit short of the bunker on 18. Nelson and the other captain (Harry Weetman) were near the green when the Great Britain captain said, “There’s no chance Venturi will get this ball up and down.” Well, Byron kinda huffed back, “Well, watch this.” Venturi knocked his chip to within inches of the cup and the U.S. won that match, 1 up. Byron knew Ken was a great chipper off tight lies like the one he faced. In 1993 when you were Captain, Chip Beck and John Cook beat Nick Faldo and Colin Montgomerie, 1 up. How important was that win? You mentioned at one of your early press conferences how you hope to be lucky as the Ryder Cup captain. When I was captain in 1993 at The Belfry, I told the team on Saturday night they were going to win tomorrow because “I’m the luckiest SOB in the world.” I said,”You’re going to have the Watson luck with you tomorrow.” And then Lanny Wadkins chirps up, “Yeah, that’s right, Tom. You are the luckiest SOB around!” So, luck has something to do with it but there’s more to it than that. You see more holed shots off the green in the Ryder Cup than any other tournament. Why is that? Because each shot is worth more to these players. They’re trying to hole these shots whereas when they’re playing in a normal tournament they might be content to just get it close. But in the Ryder Cup, they’re trying to hole shots. It’s just amazing and it’s not always luck.